Map courtesy The Boring Co. The Boring Company is proposing to build Dugout Loop, a zero-emissions, high-speed, underground public transportation system from the Los Feliz, East Hollywood, or Rampart Village neighborhoods to Dodger Stadium in the City of Los Angeles. The purpose of Dugout Loop is to help reduce traffic in Los Angeles by providing a clean and efficient public transportation option to Dodger Stadium. Dugout Loop will complement existing public transportation systems and provide an all-electric and affordable alternative that will transport baseball fans and concertgoers directly to the Dodger Stadium… in less than 4 minutes! The eastern station is planned to be built in the ballpark parking lot while the western station, will be on private property owned by the Boring Co. next to one of three Metro Red Line stations — either Vermont/Sunset, Vermont/Santa Monica or Vermont/Beverly. Fares are planned to be about $1, reservations will be needed and passengers will ride on autonomous skates that can reach speeds of 125 mph, according to the Boring Co. This is certainly an interesting development. Metro has been running the popular Dodger Stadium Express to Union Station since 2010 (and another route from Harbor Gateway since 2015) and the agency is currently evaluating a proposal from Los Angeles Aerial Rapid Transit to build a privately-funded tram between Union Station and the ballpark. As for this new proposal, Metro officials say it’s a positive development because the more mobility options, the better for everyone. The agency plans to continue talking to the Boring Company about their tunneling plans in our region to ensure projects do not interfere with existing or future Metro projects. BTW, the Dodgers have led the Major Leagues in attendance since 2013 and there is now the possibility of there being three transit options to reach the ballpark in the future: the bus, the aerial tram and the Dugout Loop. None of these have the capacity on their or even together to get everyone to a game — Dodger Stadium, built atop a hill and downtown proper, can hold about 56,000 fans — but the transit options together could give more people options other than driving. In the aftermath of the Sept. 11 attacks, billions were spent to tighten airport security. Passengers were subjected to extensive screenings, biometric scans, ID checks and limitations on what can be taken on flights. But the same protections have not been extended to transit hubs, where the only check is typically for a ticket. However, those pale in comparison to the inconveniences and slowdowns I-5 travelers would experience without these projects. It is a cold, hard fact that not only is the I-5 one of the most heavily traveled freeways in the nation, but also that the demands placed on it are only going to increase through a variety of factors, including increased interstate and in-state commercial traffic. And, make no mistake, regional growth will place additional demands on the already-busy freeway. With the Newhall Ranch project in the Santa Clarita Valley and the proposed Centennial development, on Tejon Ranch, adding approximately 40,000 new homes to the region in the next couple of decades, we’re going to need all the capacity we can get. The new $2.2-billion transit center — officially known as Salesforce Transit Center — in downtown San Francisco opened last week. The three-block long station with a rooftop park will serve buses for the time being. Next up is a Caltrain commuter rail station and, in the future, high-speed rail. “passengers will ride on autonomous skates that can reach speeds of 125 mph, according to the Boring Co.” to and from Dodger Stadium. I will need to see a photo before I decide if this sounds very dangerous. Seriously, i bet it would be far cheaper to build a new stadium downtown next to Staples Center and near the rail lines. A new stadium downtown would be a waste of developable land. The Dodgers just spent millions upgrading the iconic stadium. 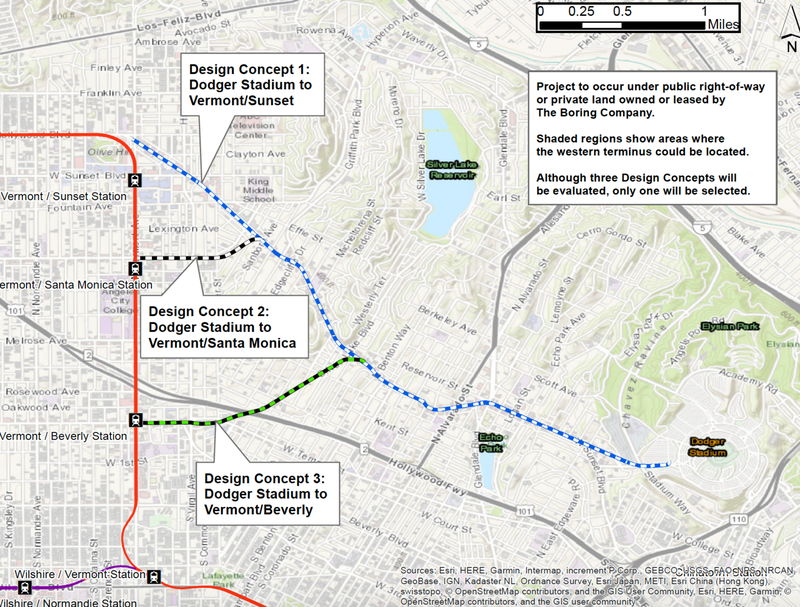 It’s actually smart that both Dodger Stadium transit proposals involve no Metro $. For a venue that is used less than 100 days a year, private funding is best for the taxpayers. Build the Vermont/Santa Monica option that can eventually be extended westward down a new corridor and build it so it can be extended eastward to Union Station. May the Queen of Soul Rest In Peace. With all due RESPECT, “I Say a Little Prayer” is far from her best song. I’d be so bold to say Dionne Warwick actual did that one better. We’ll remember Aretha today on the freeway of love (the city traffic’s moving way too slow). Although I like musks idea of dealing with traffic in Hollywood area, I wish he would actually extend to union station or even Chinatown. This is because it would a quick connector for people who work in Pasadena but live in Hollywood do they would have to go through downtown. What do you all think? Just build the Yellow Line to North Hollywood with a stop at Elysian Park (better access to the park which can be used by the public year-round/walk to the stadium) and call it a day. Also, this may sound stupid to some people, but why do I need to be at a Dodger Stadium in only 4 minutes?? Even Union Station gets a maybe for that. Hey Elon, I’m not saying your ideas are stupid, but they REALLY need to be executed better in both theory and practice. The most expensive thing in the world is digging holes in the ground. You want to be very careful in choosing which holes to dig. That is, they will actually be worth digging/doing. Unless the cost can be drastically reduced, these kind of things will not happen. BUT. If the costs can be significantly reduced. Then we all will be amazed at the possibilities. So, when we start seeing some tunnels built with good results, then the new world will be here. Should build a high speed line from Dodger Stadium to LAX via Downtown LA, which will make more sense for people to commute airport to the city faster. Fred, one of Metro’s proposals for the Sepulveda Line is an extension of the Purple Line subway from Westwood to LAX. That’s a more direct (and cheaper) way than via Dodger Stadium. Would love to see a full-fledged subway running under Santa Monica Blvd and Sunset Blvd, starting in West Hollywood and heading east to Silverlake, Echo Park, Elysian Park and then Downtown LA. If designed well, it could get people to Dodger Stadium quickly and easily.